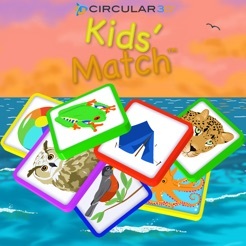 An Educational Picture Matching Game For Kids. Review your child's progress with detailed Report Cards! 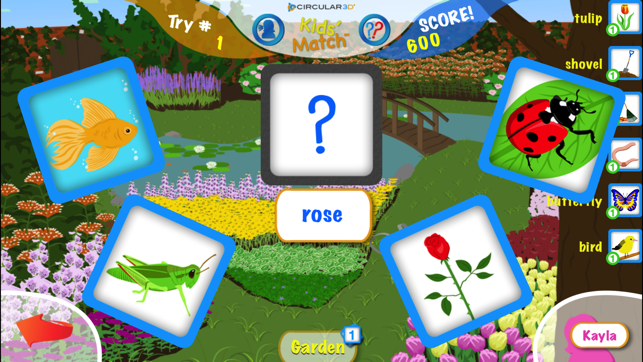 Kids' Match is an educational game for parents and teachers looking to evaluate their kids in picture and word recognition. 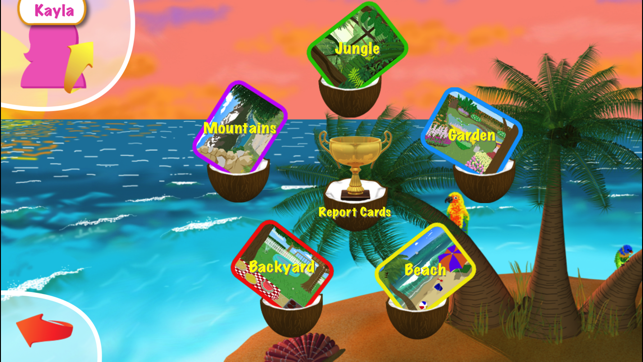 Each game is recorded to the Report Cards section and will identify where your kids are struggling and excelling. Stay close to your child's test scores and progress. Find out which words your child struggles with the most using our beautifully crafted score sheets. 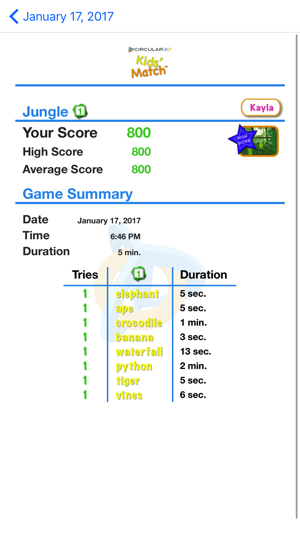 Vocabulary lists are representative of each theme providing a well rounded selection of words to test on. Each word is presented with an associated flash card. 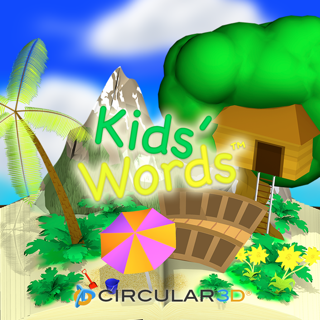 The word is pronounced both before and after completion allowing your child the best opportunity of recognizing the correct words. Kids will find themselves captivated as they listen to music for each theme composed by our in-house music studio. 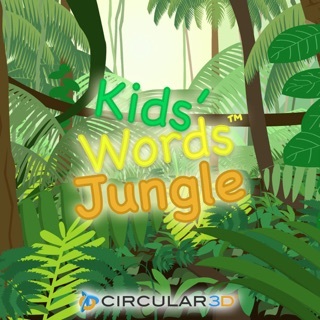 In addition, realistic sound effects appropriate to each theme will encourage your child to completely immerse themselves into the experience. 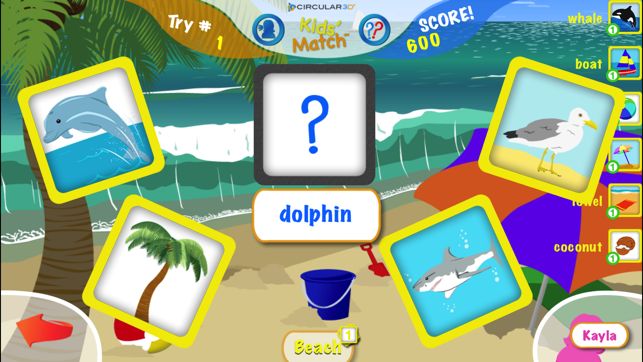 Test your child's vocabulary with over 100 age-appropriate flash cards. The words match the theme that the child is playing in. Support for as many children and teachers as you like! This app is capable of managing many children for as many parents or teachers that you need. Our app is crafted to the utmost of quality, to be beautiful and engaging. 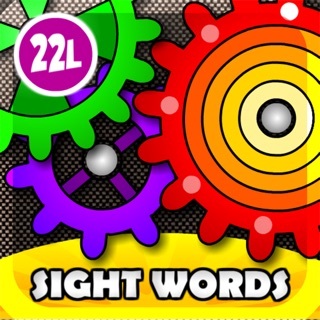 From the music and sounds to the graphics and underlying learning experience, each piece of the app is beautifully crafted to exceed your expectations. We do not collect any data from the app. We respect your privacy and the privacy of your children. If you would like to send us input on how we can improve our products, please visit our website and send us a message! This is a very high quality game that is very motivating to young kids. The soft woman's voice is so friendly and encouraging, that it makes kids want to learn and get the right answer, just to show her how smart they are. 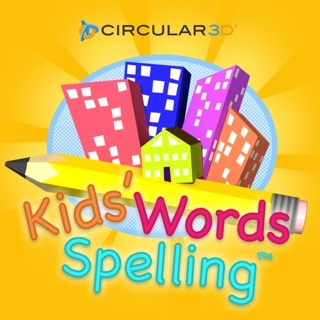 Great App for young kids to help them in their vocabulary. Great educational fun for me and my kids!